Birds Eye Steakhouse Grill Advert - Do You Remember? # Will it be chips or jacket spuds? Will it be salad or frozen peas? Will it be mushrooms? Fried onion rings? We'll have to wait and see... Hope it's chips it's chips, we hope it's chips it's chips...# etc as they drive off. A great advert that is still stuck in my head! 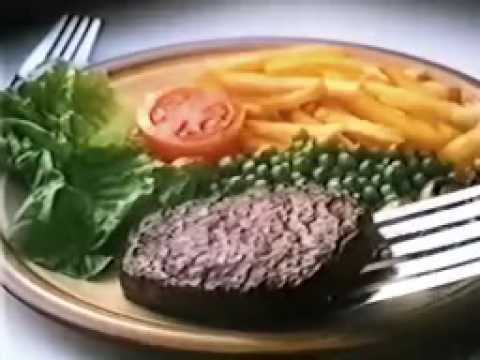 Do You Remember Birds Eye Steakhouse Grill Advert? One of the actors singing "you'll have to wait and see" is Daniel Peacock (front left), who played "Mental Mickey" in an Only Fools and Horses episode ("It's Only Rock n Roll"). He's also appeared in One Foot in The Grave as the "Neanderthal" gardener who bury's Victor up to his neck in the garden and appeared in another 1980s musical advert, for Do It All DIY stores ("If only they knew it, how Do It All do it.... you can bet, they'd be doing it as well"). Daniel's father is Trevor Peacock, who starred in the Vicar of Dibley as Jim "No no no yes" Trott. What's the question at the end of adver? Is it "Will you give your old man one of these stake house grillsk?" It's hard to understand. Re the McCain 'feed me' advert: A distant memory tells me that the "mum" in that commercial was none other than Helen Lederer. Anyone able to confirm this? Definately the 'Daddy or chips?' advert! Does anyone know where I can see it?